Beauty and perfection at its best! 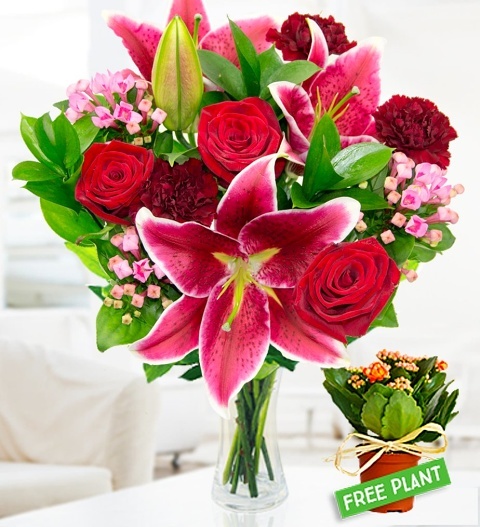 This bouquet includes impeccable Grandprix Roses, Stargazer Lilies, bold red Carnations, and Bouvardia for added texture and colour contrast. Perfect for birthdays, anniversaries, or any other special occasion. This selection of specially selected stems will make any lucky recipient feel pampered! Each of these gorgeous stems is carefully arranged by our team of professionals and this bouquet is available for UK next day delivery. Chocolates may contain nuts.